Creating recruitment videos is an important part of every successful talent acquisition strategy. Even if you have no budget and no previous experience, in this blog post you'll learn useful tips that will help you create a perfect recruiting video! Video dominates social media, and soon it will take over recruitment too. Leading companies are already creating recruitment videos and using them to achieve their talent acquisition goals. Using videos in recruitment is definitely one of the recruiting trends you should implement in 2019. Download our List of 15 recruiting trends to implement in 2019! If you’re recruiting for a big company, you need to start creating recruitment videos in order to keep up with your competitors. If you’re recruiting for a smaller company, creating a recruitment video is your chance to differentiate your company from its competitors in a war for talent. How to create a perfect recruitment video? Creating a perfect recruitment video doesn’t have to a long, complicated and costly endeavor. Contrary to popular belief, you don’t need a big budget, fancy equipment and a full crew to create a perfect recruitment video. Avoid the boring corporate business language and shabby buzzwords. Make your recruitment video fun - both for your employees and your potential job candidates. Start with your employees. It is important that your employees have fun while making your recruiting video. Their energy will shine through and captivate your potential candidates with its authenticity and good vibes. Don’t be afraid to use humor! Keep your recruitment videos short. Recruitment videos should be no longer than 3 minutes. Even if you create a great, captivating recruitment video, the chances are that most candidates won’t watch the whole thing if it is longer than 5 minutes. 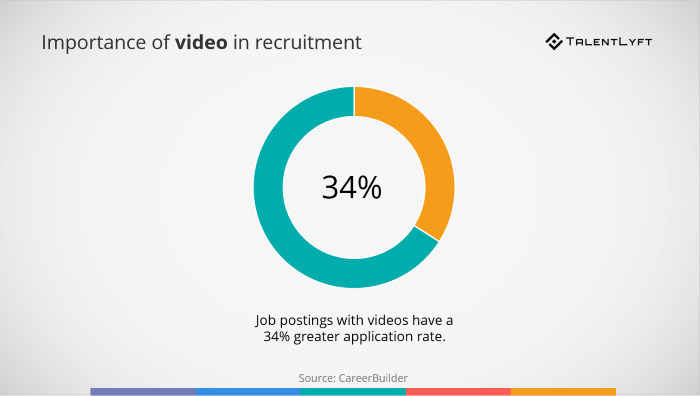 SkillScout analyzed 450+ job and company videos across YouTube and Vimeo channels and found out that the average amount of time candidates spend watching recruitment videos is 1 minute and 36 seconds. Why did you join [insert your company’s name]? What do you love about working at [insert your company’s name]? How would you characterize your fellow employees? Describe [insert your company’s name]’s workplace in three words? Describe your regular working day. Tell us about an exciting project you are working on. Why do you stay at [insert your company’s name]? Ask questions and record your employees' unrehearsed answers. You can cut and edit them later! Besides your employee's testimonials, use your recruitment video to showcase your company culture. Your potential candidates want to see the faces of people they’d be spending most of their days, but also a place where they would work. Let them see your organization and workplace! Give them a glimpse into your workplace atmosphere and everyday life at your office. 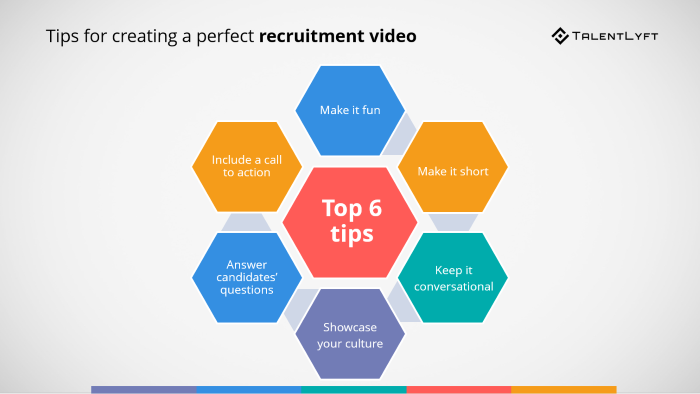 Make sure you use your recruitment video to communicate what’s important to job seekers. They want to know what it is like to work at your company and they want to see the faces of people they might be working with. However, they might also have some specific questions depending on candidate journey stage they are in. Create useful video recruitment content or every step of the candidate journey! My final tip for creating a perfect recruitment video is to include a call to action. Tell your potential candidates exactly what you want them to do after they finish watching your recruitment video. Do you want them to check out your open job positions? Read your career blog? Visit your career site? Join your talent network? Make it clear by presenting a strong call to action at the end of your recruiting video. Most companies don’t have an in-house camera crew or a production studio at their disposal to help them create their recruitment video. If you have a certain budget for recording a recruitment video, you can hire professionals to help you. Think about hiring an external freelancer or video production agency. Use what you’ve got. Yes, that's right. You don’t need fancy cameras, tripods or microphones. Any recent smartphone will do. Make sure you have enough light in your recording space. When it comes to lightning, make sure that the light is on the objects you film. If the light comes behind your object, you will only the silhouettes. Sound matters! The terrible sound is actually more annoying than terrible video. Try to film your videos in a place where you can actually hear people your interview. When interviewing your employees, make sure you are in a quiet surrounding. A quiet office is probably a better choice than an office cafeteria. If you still hesitate about creating your own recruiting video, there are cool tools to help you. For example, check out Moovly which offers templates for creating recruitment videos. It is an easy, professional, and cost-effective way to create your recruitment videos, including video job descriptions, employee testimonials and company culture videos. Once you've created a great recruitment video, you need to get it out there for the world to see it! Promote your recruiting video throughout as many candidate journey touchpoints as you can. Promote your recruitment video on social media networks such as your LinkedIn, Facebook, Twitter and don’t forget about Instagram! Ask your employees to share your recruitment video on their own, private social media profiles. Make sure to feature your recruitment video on your career site. Recruitment videos are also a great content idea for your company’s career blog. Upload your recruitment video on video platforms such as Youtube and Vimeo. Using a recruitment video will help you enhance your employer brand on the company’s review sites such as Glassdoor. Send your recruitment video via your company’s newsletter to keep the candidates from your talent pool up to date and engaged. A recruitment video should be a part of your job descriptions and job ads! Play your recruitment videos on your recruitment events such as job fairs and campus events. How to Create Newspaper Job Ads? How SEO Can Help Attract the Best Talent? How to Turn Employees into Employer Brand Ambassadors? How to Find Candidates Using Instagram?